Our offered PTFE Products or Poly Tetra Fluoro Ethylene Products are manufactured using best quality raw material. This ensures high durability and functionality of the products. 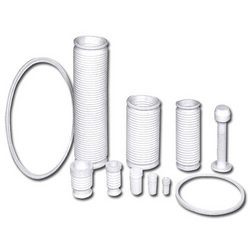 Known for its wide features such as high performance, quality and effective performance, this range of PTFE Components is available to our clients as per the predefined industrial standards. Made of best quality raw material, this component range is available in a durable price and is in a consistent demand by our varied customers for its long lasting service. This component unit has good dimensional stability, good corrosion resistance, aging resistance and low coefficient of friction. Abiding by ethical norms of the industry, we are engaged in manufacturing and supplying high grade PTFE Ring. Our offered PTFE rings are high in demand as these are in-tandem with globally laid quality norms. 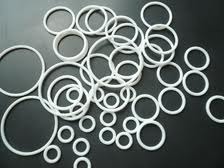 To ensure the same, we manufacture these PTFE rings by using optimum quality PTFE(Polytetrafluoroethylene), sourced from the most accredited vendors of the industry. 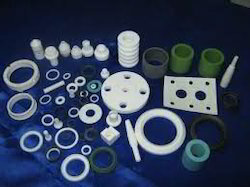 Owing to which, offered PTFE rings have excellent strength and ensure reliable performance. Leveraging on the support of sound infrastructure, we are able to offer patrons flawless assortment of PTFE Bellows. To stand tall on the expectations of patrons, we provide these PTFE bellows as per their given specifications. Our offered PTFE bellows are basically used for the purpose of ensuring fine flow of pipeline from primary glass equipment. We manufacture these PTFE bellows using high grade PTFE(Polytetrafluoroethylene) to ensure these are corrosion & chemical resistant, have dielectric properties, minimum friction coefficient.